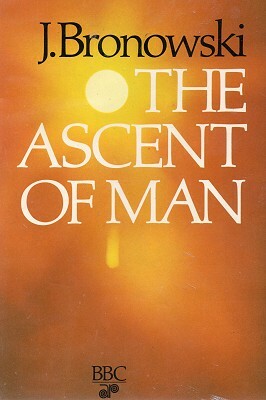 The Ascent of Man: 2, 1973. 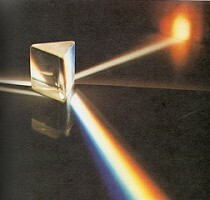 The history of man is divided very unequally. First there is his biological evolution: all the steps that separate us from our ape ancestors. Those occupied some millions of years. And then there is his cultural history: the long swell of civilisation that separates us from the few surviving hunting tribes of Africa, or from the food-gatherers of Australia. And all that second, cultural gap is in fact crowded into a few thousand years. It goes back only about twelve thousand years - something over ten thousand years, but much less than twenty thousand. From now on I shall only be talking about those last twelve thousand years which contain almost the whole ascent of man as we think of him now. Yet the difference between the two numbers, that is, between the biological time-scale and the cultural, is so great that I cannot leave it without a backward glance. It took at least two million years for man to change from the little dark creature with the stone in his hand, Australopithecus in Central Africa, to the modern form, Homo sapiens. That is the pace of biological evolution - even though the biological evolution of man has been faster than that of any other animal. But it has taken much less than twenty thousand years for Homo sapiens to become the creatures that you and I aspire to be: artists and scientists, city builders and planners for the future, readers and travellers, eager explorers of natural fact and human emotion, immensely richer in experience and bolder in imagination than any of our ancestors. That is the pace of cultural evolution; once it takes off, it goes as the ratio of those two numbers goes, at least a hundred times faster than biological evolution. Once it takes off: that is the crucial phrase. Why did the cultural changes that have made man master of the earth begin so recently? Twenty thousand years ago man in all parts of the world that he had reached was a forager and a hunter, whose most advanced technique was to attach himself to a moving herd as the Lapps still do. By ten thousand years ago that had changed, and he had begun in some places to domesticate some animals and to cultivate some plants; and that is the change [Page 60] from which civilisation took off. It is extraordinary to think that only in the last twelve thousand years has civilisation, as we understand it, taken off. There must have been an extraordinary explosion about 10,000 BC - and there was. But it was a quiet explosion. It was the end of the last Ice Age. We can catch the look and, as it were, the smell of the change in some glacial landscape. Spring in Iceland replays itself every year, but it once played itself over Europe and Asia when the ice retreated. And man, who had come through incredible hardships, had wandered up from Africa over the last million years, had battled through the Ice Ages, suddenly found the ground flowering and the animals surrounding him, and moved into a different kind of life. It is usually called the agricultural revolution. But I think of it as something much wider, the biological revolution. There was intertwined in it the cultivation of plants and the domestication of animals in a kind of leap-frog. And under this ran the crucial realisation that man dominates his environment in its most important aspect, not physically but at the level of living things -plants and animals. With that there comes an equally powerful social revolution. Because now it became possible - more than that, it became necessary - for man to settle. And this creature that had roamed and marched for a million years had to make the crucial decision: whether he would cease to be a nomad and become a villager. We have an anthropological record of the struggle of conscience of a people who make this decision: the record is the Bible, the Old Testament. I believe that civilisation rests on that decision. As for people who never made it, there are few survivors. There are some nomad tribes who still go through these vast transhumance journeys from one grazing ground to another: the Bakhtiari in Persia, for example. And you have actually to travel with them and live with them to understand that civilisation can never grow up on the move. Everything in nomad life is immemorial. The Bakhtiari have always travelled alone, quite unseen. Like other nomads, they think of themselves as a family, the sons of a single founding father. The Bakhtiari take their name from a legendary herdsman of Mongol limes, Bakhtyar. The legend of their own origin thai they tell of him begins. And the father of our people, the hill-man, Bakhtyar, came out of the fastness of the southern mountains in ancient times. His seed were as numerous as the rocks on the mountains, and his people prospered. The biblical echo sounds again and again as the story goes on. The patriarch Jacob had two wives, and had worked as a herdsman for seven years for each of them. The first wife of Bakhtyar had seven sons, fathers of the seven brother lines of our people. His second wife had four sons. And our sons shall take for wives the daughters from their father's brothers' tents, lest the flocks and tents be dispersed. As with the children of lsrael, the flocks were all-important; they are not out of the mind of the storyteller (or the marriage counsellor) for a moment. Before 10,000 BC nomad peoples used to follow the natural migration of wild herds. But sheep and goats have no natural migrations. They were first domesticated about ten thousand years ago - only the dog is an older camp follower than that. And when man domesticated them, he took on the responsibility of nature; the nomad must lead the helpless herd. 20. The long swell of civilisation is crowded into a few thousand years. 21. Nomad tribes will go through these vast transhumance journeys from one grazing ground to another. The role of women in nomad tribes is narrowly defined. Above all, the function of women is to produce men-children; too many she-children are an immediate misfortune, because in the long run they threaten disaster. Apart from that, their duties lie in preparing food and clothes. For example, the Women among the Bakhtiari bake bread — in the biblical manner, in unleavened cakes on hot stones. But the girls and the women wait to eat until the men have eaten. Like the men, the lives of the women centre on the flock. They milk the herd, and they make a clotted yoghourt from the milk by churning it in a goatskin bag on a primitive wooden frame. They have only the simple technology that can be carried on daily journeys from place to place. The simplicity is not romantic; il is a matter of survival. Everything must he light enough to be carried, to he set up evrry evening and to he packed away again evei y morning. 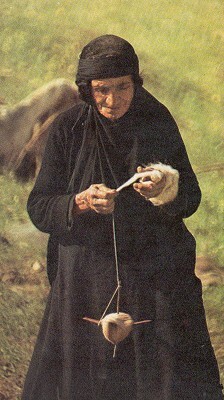 When the [Page 62] women spin wool with their simple, ancient devices, it is for immediate use, to make the repairs that are essential on the journey, no more. It is not possible in the nomad life to make things that will not be needed for several weeks. They could not be carried. And in fact the Bakhtiari do not know how to make them. If they need metal pots, they barter them from settled peoples or from a caste of gipsy workers who specialise in metals. A nail, a stirrup, a toy, a child's bell is something that is traded from outside the tribe. The Bakhtiari life is too narrow to have time or skill for specialisation. There is no room for innovation, because there is not tmie, on the move, between evening and morning, coming and going all their lives, to develop a new device or a new tlx >ughl not even a new tune. The only habits that survive are the old habits. The only ambition of the son is to be like the lather. It is a life without features. Every night is the end of a day like the last, and every morning will be the beginning of a journey like the day before. When the day breaks, there is one question in everyone's mind: Can the flock be got over the next high pass? One day on the journey, the highest pass of all must be crossed. This Is the pass Zadeku, twelve thousand feet high on the Zagros, which the flock must somehow struggle through or skirt in its upper reaches. For the tribe must move on, the herdsman must find new pastures every day, because at these heights grazing is exhausted in a singleday. Every year the Bakhtiari cross six ranges of mountains on the outward journey (and cross them again to come back). They march through snow and the spring flood water. And in only one respect has their life advanced beyond that of ten thousand years ago. The nomads of that time had to travel on foot and carry iheir own packs. The Bakhtiari have pack-animals -horses, donkeys, mules - which have only been domesticated since that time. No thing else in their lives is new. Nomads have no memorials, even to the dead. The only mounds that they build are to mark the way at such places as the Pass of the Women, treacherous but easier for the animals than the high pass. The spring migration of the Bakhtiari is a heroic adventure; and yet the Bakhtiari are not so much heroic as stoic. They are resigned because the adventure leads nowhere. The summer pas­tures themselves will only be a stopping place - unlike the children of Israel, for them there is no promised land. The head of the family has worked seven years, as Jacob did, to build a flock of fifty sheep and goats. He expects to lose ten of them in the migration if things go well. If they go badly, he may lose twenty out of that fifty. Those are the odds of the nomad life, year in and year out. And beyond that, at the end of the journey, there will still be nothing except an immense, traditional resignation. Who knows, in any one year, whether the old when they have crossed the passes will be able to face the final test: the crossing of the Bazuft River ? Three months of melt-water have swollen the river. The tribesmen, the women, the pack animals and the flocks are all exhausted. It will take a day to manhandle the flocks across the river. But this, here, now is the testing day. Today is the day on which the young become men, because the survival of the herd and the family depends on their strength. Crossing the Bazuft River is like crossing the Jordan; it is the baptism to man­hood. For the young man, life for a moment comes alive now. And for the old - for the old, it dies. What happens to the old when they cannot cross the last river ? They stay behind to die. Only the dog is puzzled to see a man abandoned. The man accepts the nomad custom; he has come to the end of his journey, and there is no place at the end. The largest single step in the ascent of man is the change from nomad to village agriculture. What made that possible ? An act of will by men, surely; but with that, a strange and secret act of nature. In the burst of new vegetation at the end of the Ice Age, a hybrid wheat appeared in the Middle East. It happened in many places: a typical one is the ancient oasis of Jericho. Jericho is older than agriculture. The first people who came here and settled by the spring in this otherwise desolate ground were people who harvested wheat, hut did not yet know how to [Page 72] plant it. We know this because they made tools for the wild harvest, and that is an extrodinary piece of foresight. They made sickles out of flint which have survived; John Garstang found them when he was digging here in the 1930s. The ancient sickle edge would have been set in a piece of gazelle horn, or bone. but did not yet know how to plant it. They made tools for the wild harvest. The flint sickle blades were set into a horn handle. There no longer survives, up on the hill or tel and its slopes, the kind of wild wheat that the earliest inhabitants harvested. But the grasses that are still here must look very like the wheat that they found, that they gathered for the first time by the fistful, and cut with that sawing motion of the sickle that reapers have used for all the ten thousand years since then. That was the Natufian pre-agricultural civilisation. And, of course, it could not last. It was on the brink of becoming agriculture. And that was the next thing that happened on the Jericho tel. The turning-point to the spread of agriculture in the Old World was al most certainly the occurrence of two forms of wheat with a large, full head of seeds. Before 8000 bc wheat was not the luxuriant plant it is today; it was merely one of many wild grasses that spread throughout the Middle East. By some genetic accident, the wild wheat crossed with a natural goat grass and formed a fertile hybrid. That accident must have happened many times in the springing vegetation that came up after the last Ice Age. In terms of the genetic machinery that directs growth, it combined the fourteen chromosomes of wild wheat with the fourteen chromosomes of goat grass, and produced Emmer with twenty-eight chromosomes. That is what makes Emmer so much plumper. The hybrid was able to spread naturally, because its seeds are attached to the husk in such a way that they scatter in the wind. For such a hybrid to be fertile is rare but not unique among plants. But now the story of the rich plant life that followed the Ice Ages becomes more surprising. There was a second genetic accident, which may have come about because Emmer was [Page 68] already cultivated. Emmer crossed with another natural goat grass and produced a still larger hybrid with forty-two chromo­somes, which is bread wheat. That was improbable enough in itself, and we know now that bread wheat would not have been fertile but for a specific genetic mutation on one chromosome. Yet there is something even stranger. Now we have a beautiful ear of wheat, but one which will never spread in the wind because the ear is too tight to break up. And if I do break it up, why, then the chaff flies off and every grain falls exactly where it grew. Let me remind you, that is quite different from the wild wheats or from the first, primitive hybrid, Emmer. In those primitive forms the ear is much more open, and if the ear breaks up then you get quite a different effect - you get grains which will fly in the wind. The bread wheats have lost that ability. Suddenly, man and the plant have come together. Man has a wheat that he lives by, but the wheat also thinks that man was made for him because only so can it be propagated. For the bread wheats can only multiply with help; man must harvest the ears and scatter their seeds; and the life of each, man and the plant, depends on the other. It is a true fairy tale of genetics, as if the coming of civilisation had been blessed in advance by the spirit of the abbot Gregor Mendel. 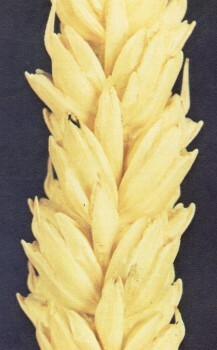 two hybrid forms of wheat. 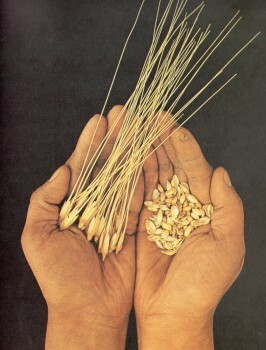 head of wheat; and the husk being removed from the grain. A happy conjunction of natural and human events created agriculture. In the Old World that happened about ten thousand years ago, and it happened in the Fertile Crescent of the Middle East. But it surely happened more than once. Almost certainly agriculture was invented again and independently in the New World - or so we believe on the evidence we now have that maize needed man like wheat. As for the Middle East, agricul­ture was spread here and there over its hilly slopes, of which the climb from the Dead Sea to Judea, the hinterland of Jericho, is at best a characteristic piece and no more. In a literal sense, agriculture is likely to have had several beginnings in the Fertile Crescent, some of them before Jericho. Yet Jericho has several features which make it historically unique and give it a symbolic status of its own. Unlike the for­gotten villages elsewhere, it is monumental, older than the Bible, layer upon layer of history, a city. The ancient sweet-water [Page 69] city of Jericho was an oasis on the edge of the desert whose spring has been running from prehistoric times right into the modern city today. Here wheat and water came together and, in that sense, here man began civilisation. Here, too, the bedouin came with their dark muffled faces out of the desert, looking jealously at the new way of life. That is why Joshua brought the tribes of Israel here on their way to the Promised Land - because wheat and water, they make civilisation: they make the promise of a land flowing with milk and honey. Wheat and water turned that barren hillside into the oldest city of the world. 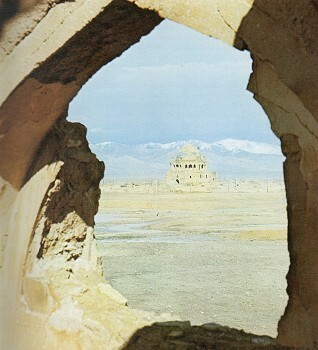 The fifth of the heirs in succession to Genghis Khan was the sultan Oljeitu, who came to this forbidding plateau in Persia to build a great new capital city, Sultaniyeh. What remains is his own mausoleum which later was a model for much Mushm architecture. Oljeitu was a liberal monarch, who brought here men from all parts of the world. He himself was a Christian, at another time a Buddhist, and finally a Muslim, and he did - at this court - attempt really to establish a world court. It was the one thing that the nomad could contribute to civilisation: he gathered from the four corners of the world the cultures, mixed them together, and sent them out again to fertilise the earth. ended the last attempt to make the nomad way of life supreme. 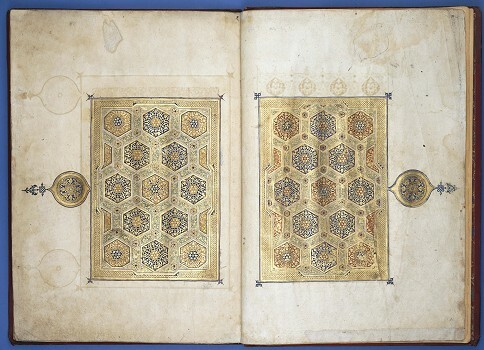 manuscript of the Koran dated 1310. It is the irony of the end of the bid for power by the Mongol nomads here that when Oljeitu died, he was known as Oljeitu the Builder. The fact is that agriculture and the settled way of life were established steps now in the ascent of'man, and had set a new level for a form of human harmony which was to bear fruit into the far future: the organisation of the city. 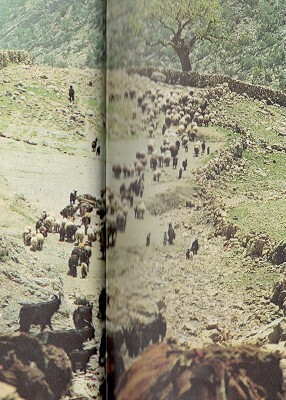 Bakhtiari Spring Migration (Anthony Howarth for Daily Telegraph Colour Library) p58. Curved sickle, Ashmolean Museum p65. Old and new strains of wheat (Tony Evans, Marcel Sire) p66, p67. 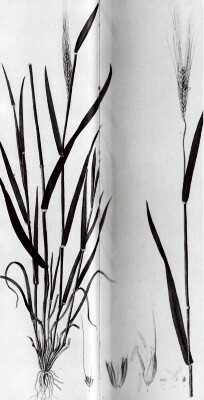 Wild wheat, from Jaubert and Spach, Oriental Plants (British Museum, Natural History) p68-p69. c. Plaster-decorated skull, Ashmolean Museum p70-p71. d. The tower at Jericho tel (Dave Brinicombe) p71. a. Carpenter, National Museum, Copenhagen; p72. b. Clay treaty nail, British Museum, London, p72. - the oldest diplomatic document known, found in Telloh, ancient Girsu, ca. 2400 BC. d. Greek toy, British Museum, London, p73. e. Old man with a wine press, British Museum, London, p73. Ploughing with harnessed oxen, Museo Civico, Bologna (C. M. Dixon) p74-p75. The relief with a scene of work in the fields, Archaeological Museum of Bologna. Copper model of a quadriga from Shara Temple at Tell Agrab, Iraq, c. 2600 BC. Oriental Institute of Chicago. b. Roman mosaic of a solid wheeled cart, Royal villa, Casale (C. M. Dixon) p76. a. Carpenters at work with a bow-lathe (India Office Library) p78. b. A mid-nineteenth 'hakak' polishing hardstones on a bow lathe. a. Mongol cavalry, and [b] troops fording a river, from the Jami' al-Tawarikh (Edinburgh University Library) p81. Greek vase painting, British Museum, London (Roynon Raikes) p83. 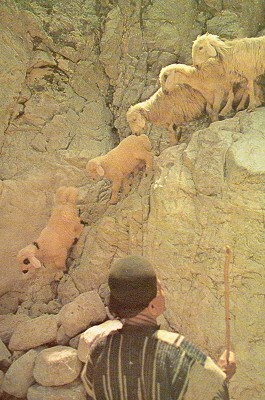 Buz Kashi, Afghanistan (David Stock) p84-p85. a. Dedication to Oljeitu in a MS of the Koran, British Museum, London p86. b. The tomb of Oljeitu Khan (Dave Brinicombe) p87. FOOTNOTES Chapter 2, Online Edition, 2016. 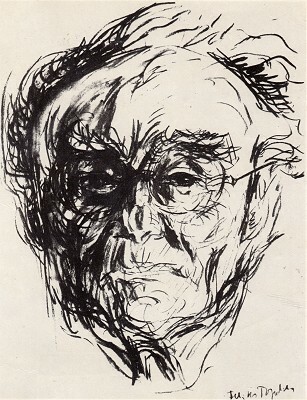 Geoff Cater (2016) : Jacob Bronowski : The Ascent of Man, Chapter 2, 1973.